Namaste Mari: Monday Morning Rambles: Human Connections and Juicer Recommendations? 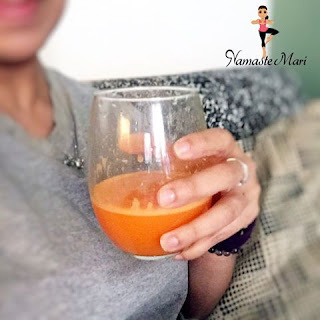 Monday Morning Rambles: Human Connections and Juicer Recommendations? Usually on the weekends, I tend to work and then stay home because I am exhausted from the week but this weekend, I actually went into the city! Me and my friend Margo organized a blogger lunch at Bare Burger in Hell's Kitchen and we had such a good time. I was hoping for more people to make it but with it being a holiday weekend, some people were out of town. 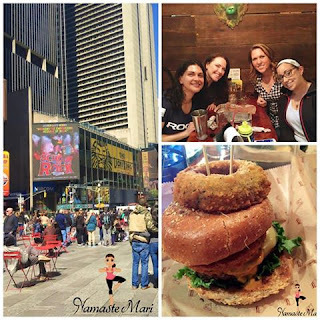 It was nice to connect with some good friends, including my chickie, Amber and having delicious food! I am known as the hermit in my family and it takes a lot for me to go out but when I do, I always have a great time. I just need to make a better effort of making plans and sticking to them. It is nice to enjoy time your alone time but we need to interact with others and make human connections as well. Remember last week I discussed doing a Nutrition Spring Cleaning? Well for the past week I have been obsessed with watching documentaries on Netflix in regards to nutrition including Fat, Sick, and Nearly Dead. Watching all these docs have been making me crave homemade juices and since I don't have a Juicer; I had to improvise. I blend it in my Nutribullet and then strain it. I am on the HUNT for a juicer and keep searching Amazon and asking my friends for recommendations and now I am asking YOU. Do you have suggestions?